Built by Rhoda Rindge Adamson and her husband Merritt Adamson in 1929, Adamson House holds a significant place in California history. 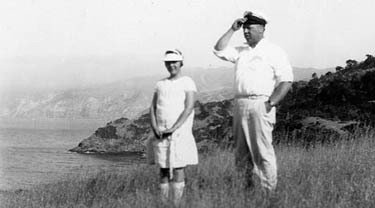 Mrs. Adamson was the daughter of Frederick Hastings Rindge and Rhoda May Knight Rindge, the last owners of the Malibu Spanish Land Grant, a vast swath of property between the mountains and the sea where the affluent beachfront city of Malibu is now situated. 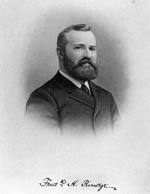 Rhoda’s visionary father, Frederick Hastings Rindge, the last owner of Malibu, was a wealthy Easterner who attended Harvard, and bought the property in 1892 for roughly $10 an acre. (Thirty years later, it became the most valuable single real estate holding in the United States.) He and his wife, a schoolteacher from Michigan, had married and moved to California five years earlier, settling in Santa Monica. With the purchase of this land, Rindge sought to create an ideal country home, one to rival seaside showplaces he had visited in France and Italy. 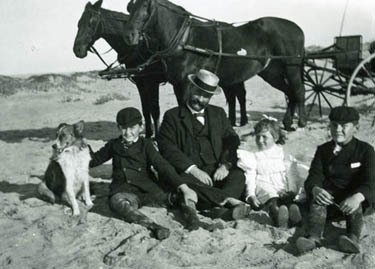 In fact their three children; Frederick Jr., Samuel, and Rhoda enjoyed life on the ranch. He referred to the Malibu coast as the “American Riviera”. A prominent businessman with diverse interests, Rindge was a romantic at heart. So enamored was he with his new property, one that eventually became a working cattle and grain-raising ranch, that he wrote several small books in praise of its charms and beauty. Notable among them is Happy Days in Southern California, available in the Malibu Lagoon Museum Visitor Center. At that time, there were no roads to Malibu. Everyone and everything came by horseback, boat, or horse-drawn wagon over packed sand, at low tide. Rindge incorporated his own railway line in 1903 to bring in supplies and ship out hides and grain. Rindge, a prominent business leader, philanthropist, and much-loved husband and father, died in 1905 at 48. His widow, May Knight Rindge, assumed stewardship of her husband’s business affairs, including the ranch, a property often referred to as “the Malibu”. Over the course of 20 years, her determined battles to keep the Malibu a private family estate, free of public roads, earned her the title “Queen of the Malibu”. Eventually, she lost the fight when the county and state obtained a right-of-way, and the Roosevelt Highway, now the Pacific Coast Highway, opened in 1926. Her moxie extended to her own business ventures. Although Frederick Rindge was one of the wealthiest men in Los Angeles, his widow was perpetually land rich and cash poor. While searching for oil on her property, she found an abundance of buff and red clay, leading to the creation of Malibu Potteries, a short-lived yet still influential tile company that produced authentic versions of Mayan, Moorish, Moroccan, Saracen, and Persian designs. Nowhere are these tiles featured more extensively than at Adamson House. May Rindge’s bold strokes in business and public affairs, especially during a time when such actions were considered unladylike, earn her status as one of California’s history-shaping women. She died in 1941 at the age of 76. 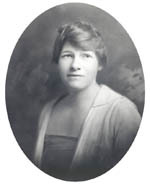 Rhoda, May Rindge’s only daughter, left California to attend Wellesley, but only for one year. The allure of her home state proved irresistible. She met Merritt Huntley Adamson when he became superintendent of her family’s Malibu ranch after graduating from USC Law School. 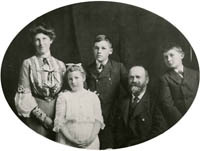 The couple married in 1915. Merritt, the son of an Arizona legislator and sheep rancher, earned the nickname “Smoke” after becoming a “blood brother” of the Havasupai tribe that shared boundaries with his family’s ranch. 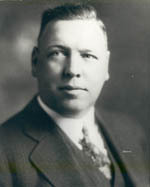 Farming was his forte and he established Adohr (his wife’s name spelled backward) Stock Farms, which became one of the world’s largest milk producers. When May Knight Rindge gave her daughter 13 acres of her coveted land, the couple pursued building a beach house. Spanish architecture seemed a natural choice for the young couple as Rhoda had grown up surrounded by themes of Spanish pioneers and Merritt’s childhood had been steeped in an Old West atmosphere. They chose one of the most picturesque sites on the property—Vaquero Hill, so called because a cowboy shack once stood there. The house, designed by well-known architect Stiles Clements, was constructed in 1929 and first used by the Adamsons as a beach house beginning in 1930. They alternated use of the beach house with their home in the Hancock Park area of Los Angeles until 1936, when the couple and their three children began living in the Malibu house year round. The Adamsons were devoted hobbyists, raising prize-winning American Saddlebred horses, and keeping a succession of animals at the beach house: goats, lambs, milk cows, bees, horses, chickens, dogs, and a donkey. Tending to this menagerie kept the Adamson children busy. Sometimes it could take an entire day to bathe all the pets using the outdoor tub that is finished in the same colorful tile as the exterior wainscoting in the back of the residence. The well-disciplined children— Rhoda, the oldest, was thirteen; her younger sister Sylvia, was nine; and Merritt, Jr. was not quite four, when they first occupied the house in 1930—had many chores to do and schedules to keep. Mealtimes of 7 am, noon and 6 pm. were strictly enforced with the kids expected to be on time, properly washed, combed, and dressed. However, the Adamson family lifestyle wasn’t without leisure pursuits, with a spacious patio, lawn, barbecue area, and swimming pool gracing the east side of the property. 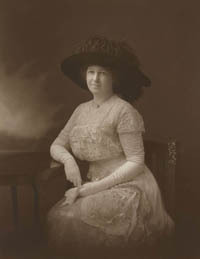 Merritt Adamson died in 1949 at age 61, well after the children had left home. Rhoda inherited her mother’s determination to carry on as a widow, adeptly managing Adohr Farms and assuming other of her late husband’s business affairs. She lived in the house until her own death in 1962 at age 69. The State of California purchased the property in 1968, intending to raze the buildings to make way for additional parking for beach goers. In 1971, the Chancellor of Pepperdine University moved in to Adamson House as part of an effort to maintain the house until it could be properly restored. The Malibu Historical Society was formed to preserve the house, which became a California Historical Landmark in 1985. The Malibu Lagoon Interpretive Association, now known as Malibu Adamson House Foundation, was formed in 1981 and presided over the opening of the house as a museum in 1983.